Washington's climate experienced a rapid course correction from cool to warm in 2012. Last year's above average temperatures contrast sharply with the relative chill of 2011. 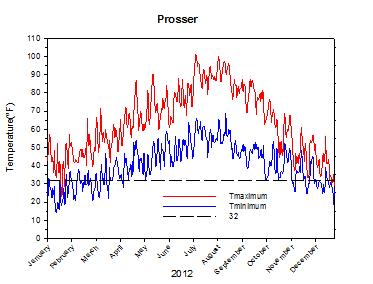 Overall, Prosser's annual temperature was 1.8 degrees warmer than 2011, and 0.7 degrees above the 1990 to 2012 average. Other eastern Washington locations including Moxee, Wenatchee, and Walla Walla were also 0.7 to 0.8 degrees above average in 2012, while Mt. 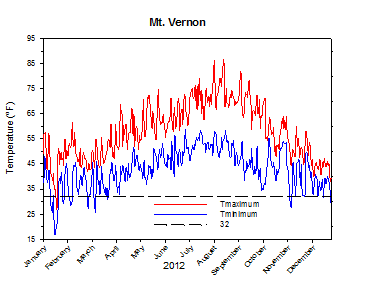 Vernon was closer to average, and only slightly (0.2 degrees) below normal. Most of the change happened in the middle of 2012. Following a relatively cold June, every month from July to December featured above average temperatures. 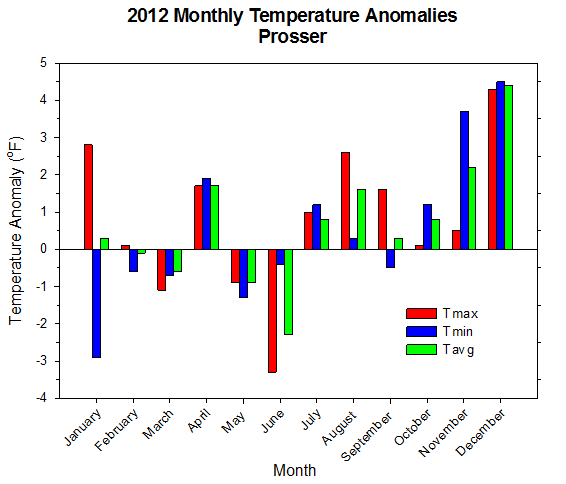 In fact, June was the only month of 2012 that featured significantly below average temperatures. 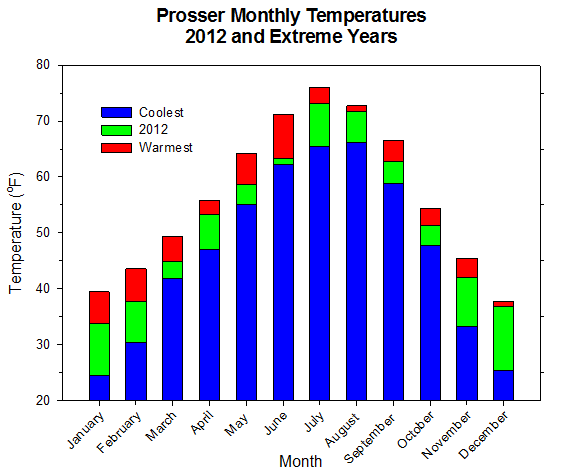 Overall, 2012 was the warmest year at Prosser since 2003. Despite experiencing its fair share of unique and hazardous weather throughout the year, the biggest weather event of 2012 occurred in January. A series of winter storms slammed Washington for a 7 to 10 day period beginning on the 14th. The most treacherous storm struck the state on January 18th, and caused heavy snowfall across much of Washington, including 17 inches in Centralia. Following a somewhat typical late winter and early spring, heat waves during both April and May showed that this year would not emulate 2011. Spring temperatures were around average, and much warmer than the record setting 2011. After a cool and wet June, July was a stormy and humid month. After record heat and humidity early in the month, July 20th provided us with one of the most significant and widespread severe weather outbreaks in recent Washington history. 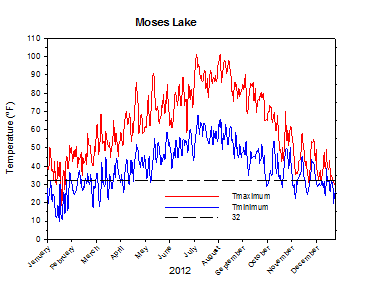 However, one of the most amazing aspects of 2012 weather was not an extreme daily event, but rather a prolonged pattern of absence, specifically an absence of water. 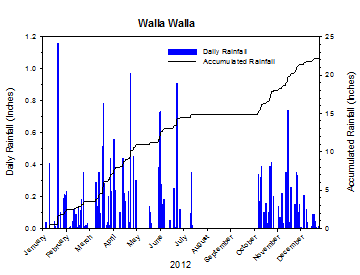 Much of Washington remained dry for several months from late July to early October. Despite the fact that summer and early autumn is a typically dry time of year, this pattern was nonetheless remarkable due to its longevity. 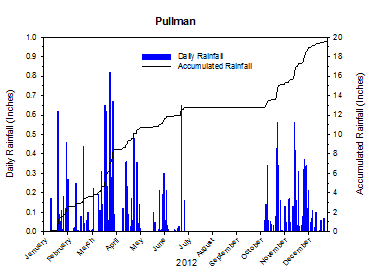 Pullman, for example, ended a 103 day consecutive dry streak on October 12th. The wildfires and smoky conditions in September were some of the worst in recent memory. However, after the meteorological water switch was flicked in mid October, we quickly transitioned from famine to feast to excess. After several months of dryness, an active pattern that featured an almost unending series of systems affected Washington for the rest of the year. Long Beach had only 7 dry days after October 11th. 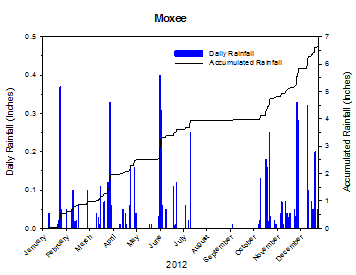 Although a transition to a wet season is typical during the autumn, 2012 was again an extreme version of normal. The year ended with mild and active conditions in November and December, both of which were the warmest at Prosser since the late 1990s. Despite many differences, 2012 shared common threads with recent years and trends, including a cool and wet early growing season that transitioned to hot and dry conditions late in the growing season. Despite an innocuous beginning, 2012 quickly found a place in the history books. From January 14 to 23, a series of winter storms pummeled Washington with a variety of weather hazards, including heavy snow and ice, strong winds, heavy rain and flooding, and bitter cold temperatures. A high impact winter storm on January 18th brought heavy snow to much of the state, including 17 inches near Centralia. Heavy ice accumulations occurred in parts of western and southeastern Washington on the 19th. As rainfall and warmer temperatures moved back into western Washington on the 20th, flooding became a problem, while periodic snowfall continued in parts of central and eastern Washington. Following a typical February, March experienced active and wet weather, with slightly below normal daytime temperatures. Long Beach received 15 inches of rain in March, and several notable storm systems brought rain and even lowland snow to Washington on the 12th and 21st. Conditions were generally warm in April, as a heat wave sent temperatures in parts of central Washington soaring to near 90 degrees on the 23rd. In fact, late April experienced a variety of weather concerns from widespread rainfall and snowmelt-induced flooding to thunderstorms and strong winds. Despite slightly cool conditions overall, a mid May heat wave sent temperatures soaring to 86 degrees at Vancouver on the 13th, and above 90 degrees in eastern Washington on May 15th. Although much of Washington remained frost-free in May, temperatures on the morning of the 10th dropped to 27 and 25 degrees at Moxee and Pullman, respectively. A chilly weather system arrived on the 22nd, and caused widespread rain and mountain snow. 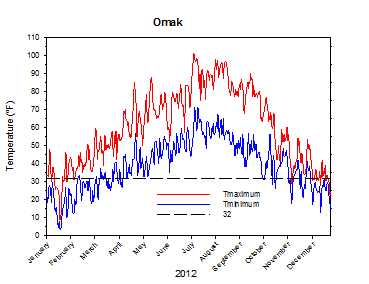 Very cool daytime temperatures and wet weather occurred in June, especially early in the month. An all-time record daily rainfall of 1.46 inches occurred on June 4th at Station 2, south of the Tri-Cities. 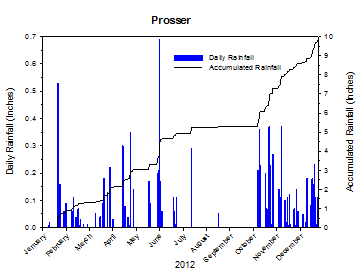 Prosser received rain on 6 of the first 7 days of the month, and experienced the second wettest June on record. Another cold weather system on June 26th brought widespread rainfall to eastern Washington, along with highs only in the 50s in many areas. The pattern changed abruptly in early July, as cool and dry weather was replaced by hot and humid conditions. Many areas were in the 100s on July 8th, and some locations had dew point temperatures in the 70s. An unusual period of stormy weather began on July 14th, and culminated with an historic severe weather outbreak on July 20th. Severe thunderstorms, torrential downpours, strong winds, and large hail were all observed during the third week of July. More seasonal weather returned for late July, and then hot and very dry weather dominated during a parched August. As very dry and warm weather continued in September, large wildfires and stagnant conditions caused extremely smoky conditions during the mid to late month time frame. In fact, Wenatchee observed very poor air quality and smoke concentrations that were up to 10 times above health standards. During the peak of the atmospheric smoke concentrations, more than half of the incoming sunshine was blocked by smoke, even on cloud-free days. 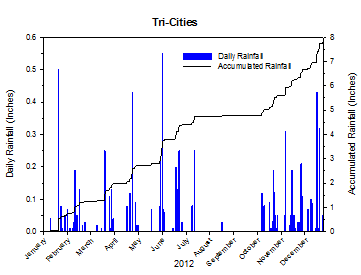 October truly behaved as a variable transition month in 2012, as long dry spells ended, and what would become long spells of wet and active weather began. Windy conditions ushered in dry air and changeable temperatures early in the month. Pullman dropped to 18 degrees on October 5th, but Long Beach climbed to nearly 80 degrees just two days later. The transition to wet weather around mid month spawned not only heavy rain in western Washington, but also moist and mild night-time weather in eastern Washington. 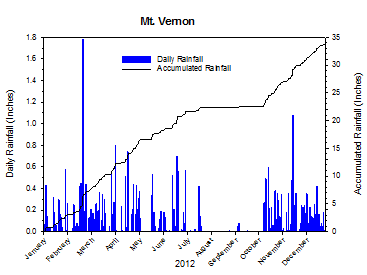 Following the first autumn Cascade snowfall on October 22nd, mild weather returned at months' end. The mild and variably active weather continued into November. November temperatures were generally above average, while the autumn season was the warmest since 1998 at Prosser. Generally, December was active and mild, especially early in the month. Cooler weather finally arrived late in the month, and just in time for a White Christmas in parts of Washington. Interestingly, December was by far the most notable temperature month of the year. 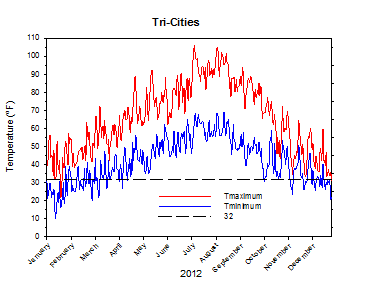 The maximum monthly departures from average in 2012 for high, low, and mean temperatures occurred in December, with positive anomalies of nearly four and a half degrees. December was also the only month of the year in which the high, low, and mean temperatures were all more than 1 standard deviation above average, which is well outside of the normal range. 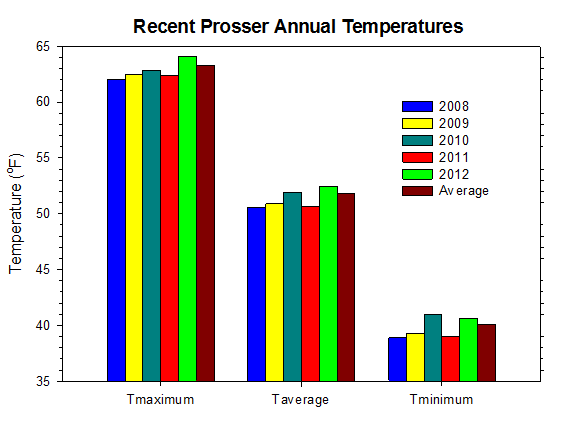 The 2012 average temperature at Prosser (WSU IAREC) was 52.5 degrees, which is 0.7 degrees above average, and 1.8 degrees warmer than 2011. The average high temperature was 64.1 degrees, which is 0.8 degrees above average, and 1.7 degrees warmer than 2011. The average low temperature was 40.6, which is 0.5 degrees above average, and 1.6 degrees warmer than 2011. 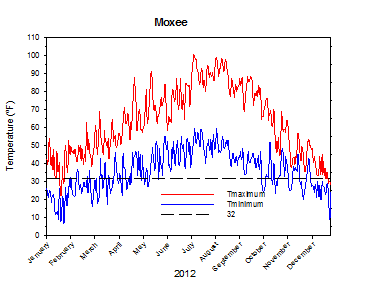 2012 was generally warmer than average, especially during the second half of the year. The average soil temperature was 56.3 degrees. 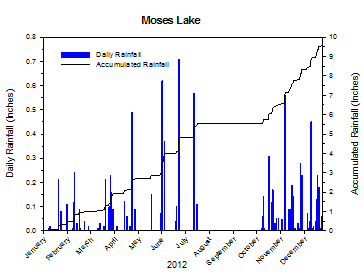 9.79 inches of precipitation fell during the year, and the average wind speed was 4.7 mph. The warmest temperature of the year was 101.2°F on July 8th, while the coolest high was 23.0°F on January 19th. The warmest low temperature was 69.0°F on August 15th, while the coldest temperature of the year was 14.1°F on January 13th. The warmest day of the year was August 6th, with an average temperature of 83.8°F, while the coldest day of the year was January 19th at 20.6°F. The coldest month of the year was January, with an average of 33.7°F, while the warmest month of the year was July, with an average of 73.1°F. 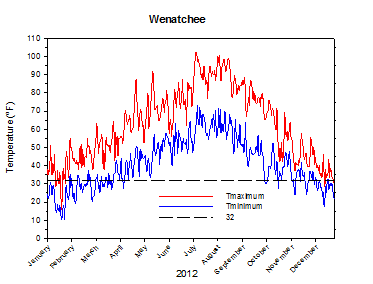 The average 2012 high and low temperatures at Wenatchee were 62.7°F and 41.2°F. January 18th: 17 inches of snow fell in the Centralia area of western Washington. January 23rd: 10 day snow totals in the Cascades measured five to eight feet. February 21st: The temperature at Buena in the lower Yakima Valley climbed to 69 degrees. March 9th: The temperature in the Tri-Cities climbed to 73 degrees. March 12th: 3 inches of rain fell at Long Beach. April 23rd: The temperature at Moxee rose to a monthly record 88.2 degrees. May 10th: The temperature at Moxee fell to 27 degrees. May 15th: The temperature in the Tri-Cities rose to 93 degrees. 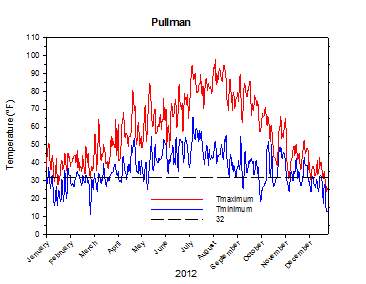 June 9th: The high temperature at Pullman was only 48 degrees. June 26th: 1.2 inches of rain fell at Davenport. July 4th: The temperature at Ritzville dropped below 34 degrees. July 8th: The high temperature at Mesa SE climbed to over 107 degrees. July 15th: 2.3 inches of rain fell at Malott, including 1.25 inches in 30 minutes. August 4th: The temperature at Vancouver soared to 101 degrees. September 7th: The temperature at Vancouver soared to 94 degrees. September 12th: The temperature at Pullman dropped to 25 degrees. October 3rd: Winds gusted to over 58 mph at Snipes in the lower Yakima Valley. 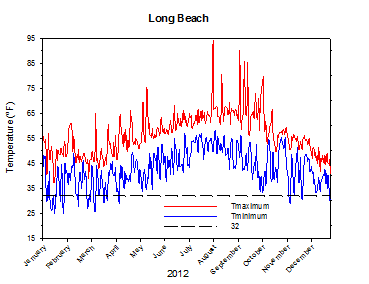 October 31st: The monthly total rainfall at Long Beach was nearly 13 inches, despite rain-free conditions for the first eleven days of the month. 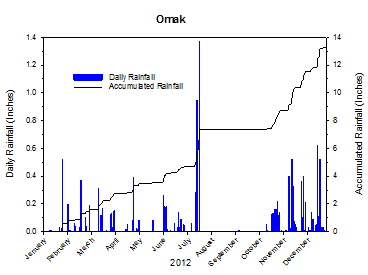 November 18th: 2.3 inches of rain fell at Tokeland. 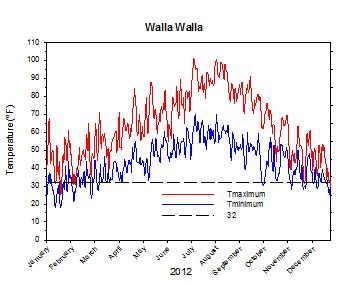 November 19th: The high temperature at Wallula was a balmy 68 degrees. 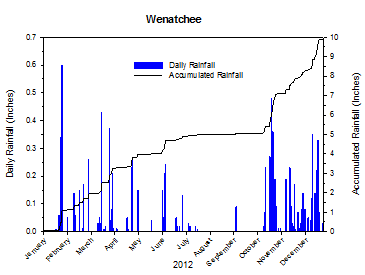 December 17th: The wind gusted to 63 mph at Wenatchee Heights. 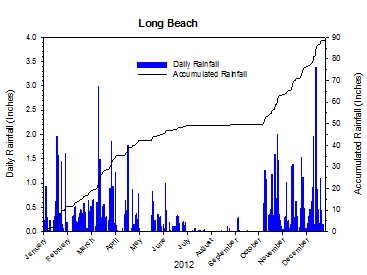 December 19th: Nearly 3 and a half inches of rain fell at Long Beach. January: Major winter storms around mid month. February: Typical late winter conditions. March: Stormy, slightly cool and wet. April: Warm, record heat wave. May: Mid month heat wave, otherwise cool. June: Very cool and wet. September: Warm, dry, and smoky. November: Active and warmer than normal. December: Stormy and mild, especially early in the month. *-Denotes a departure from normal of > 1 standard deviation. 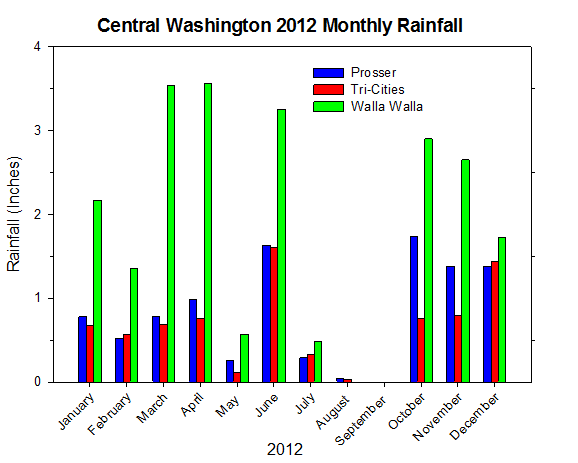 Washington agriculture generally fared well during 2012, especially when compared to the 2011 season. Temperatures and Growing Degree Day units were generally slightly above average during the growing season, while overall temperatures were above average to an even greater degree. The most significant agricultural weather hazard of 2012 was the severe weather outbreak on July 20th. Areas of large hail caused locally significant but highly variable crop damage (National Agricultural Statistics Service). GDD are calculated by subtracting a base temperature from the average daily temperature (°F). If the resulting value is less than 0, then it is set to 0. Thus GDD are always 0 or greater. 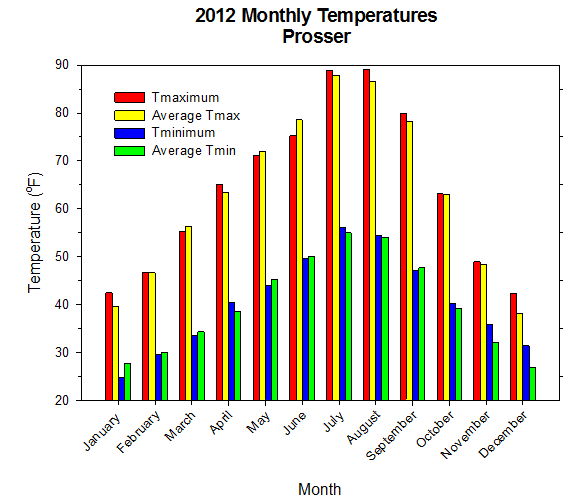 2012 was a mild year at Prosser (WSU IAREC), with a mean temperature of 52.5°F, which is 0.7 degrees above average. However, it was still one degree cooler than the remarkably warm 1992 calendar year. The Climate Prediction Center's long term outlook calls for below normal temperatures and near normal precipitation for the spring season. During late summer and early autumn, long term trends tilt the odds toward warmer and drier than normal conditions.